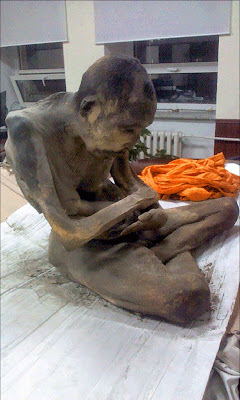 The mummy of a monk seated in a lotus position and shrouded in the skin of a cow, horse, or camel was discovered on January 27th at an undisclosed location in Songinokhairkhan province, Mongolia, and transferred to Ulaanbataar National Centre of Forensic Expertise. Thus far, only a visual examination has been done and puts the mummy's age at 200 years, leading to speculation that he taught the well-known Lama Dashi-Dorzho Itigilov, a Buryat Buddhist of the Tibetan Buddhist tradition born in 1852. Itigilov was best known for the lifelike state of his body, suggesting that this monk (IMAGE ABOVE) or another mentor taught him well the practice of self-mummification.